The Challenger 350’s cabin can carry between eight and fourteen passengers. It is 29.5 feet long, 6 feet high and 6.5 feet wide. There is 115 cubic feet of baggage space available in an unpressurized external compartment. All of the typical amenities are available as well: a fully enclosed lavatory, appliances for hot and cold food preparation, and power plugs. 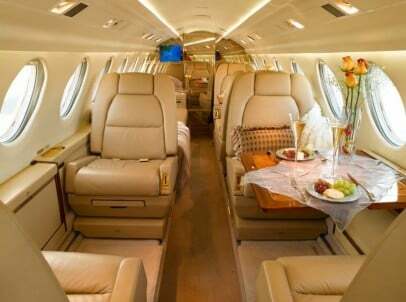 The Gulfstream G280’s cabin can carry between eight and fourteen passengers. It is 29.5 feet long, 6 feet high and 6.5 feet wide. There is 115 cubic feet of baggage space available in an unpressurized external compartment. All of the typical amenities are available as well: a fully enclosed lavatory, appliances for hot and cold food preparation, and power plugs. The Hawker Horizon’s cabin can carry between eight and fourteen passengers. It is 29.5 feet long, 6 feet high and 6.5 feet wide. There is 115 cubic feet of baggage space available in an unpressurized external compartment. All of the typical amenities are available as well: a fully enclosed lavatory, appliances for hot and cold food preparation, and power plugs. The cabin of the Challenger 300 fits eight or nine passengers in a double-club configuration (three seats can be swapped out for a 3-person divan, if desired). All of the passenger seats are fully adjustable and have fold-out tables and individual AC power plugs. Two-zone air conditioning keeps both the pilots and the passengers comfortable, and low-heat LED overhead lights (with a 10,000 hour life) give the cabin an open feel. The cabin itself stretches to a length (not including the cockpit) of 16.5 feet, a height of 6.1 feet, and a width of 7.2 feet. The 106 cubic feet of baggage (750 pounds) stored in an exterior compartment is accessible in-flight through the fully enclosed lavatory. A forward luggage closet can be added as well. The cabin of the Gulfstream G200 can be configured to hold anywhere between eight and nineteen seats. The cabin itself is 24.4 feet long, 7.2 feet wide, and 6.3 feet high. Optional additions include a radio phone, entertainment systems, and interior design upgrades. There are power outlets available for any piece of office equipment, and passengers have their own power outlets as well. There is 125 cubic feet of baggage space available in an external compartment, able to contain up to 2,400 pounds. An added bonus of the Gulfstream G200 having been designed in the extreme temperatures of Israel is its capacity to keep the cabin cool. Created by the American-based Cessna Aircraft company, the Citation X is the fastest civilian aircraft in the world, traveling at up to 525 knots by its’ two advanced and incredibly robust Rolls-Royce jet engines. The Citation X can travel up to 3,070 miles, allowing our clients to travel from coast to coast without a fuel stop. With plenty of room to stand up and move around for eight to 12 passengers – and a wide range of multi-media entertainment options and other luxurious amenities within its large, well-appointed cabin – the Citation X is one of the best choices for today’s smart jet charter consumer and business executive. The Citation Sovereign offers today’s savvy business traveler a simple proposition: Cover much more ground than the competition. In far greater comfort. Without spending much more money. If this sounds sensible to you, the Sovereign was made to fit your mission. With coast-to-coast range, impressive speed, outstanding short-field performance and the largest double-club cabin available in its class, it dramatically redefines what a midsize jet can do. This remarkable aircraft can range nearly 2,847 nautical miles (5,273 km) nonstop. By every measure, the Sovereign is more airplane for your money than any other midsize business jet ever built. The cabin of the Falcon 50EX is perhaps the part of the jet that has changed the least. It still has a height and width of 5.9 and 6.1 feet, respectively. At 23.5 feet in length the Falcon 50EX features a total cabin volume of 700 cubic feet. 115 cubic feet of baggage storage is available in internal compartments. Three closets in the cabin provide space for coats, suits, and briefcases. All baggage compartments are fully pressurized. A total of 2,205 pounds of bags can be stored. The cabin of the Hawker 1000 can come in a traditional or a biomorphic design. The biomorphic design has smooth curves and is supposed to increase passenger comfort and useful space. The cabin stretches to 24.4 feet long (not including the cockpit), 5.8 feet high, and 6 feet wide. It is usually configured to hold eight seats.